Dr. Eltahawy is Chief of Neurosurgery and Director of Neuroscience service at St. Mary Mercy Hospital in Livonia, Michigan. He specializes in complex spinal reconstructive surgery, interventional pain and functional neurosurgery. After graduating with Honors from Ain Shams University in Cairo, he completed his neurosurgery residency there and then had fellowships at Queen Square in London, University of Toronto in Functional Neurosurgery and oncology and Wayne State University in complex spine surgery. He holds a Doctorate in Neuroscience from Ain Shams University and a Masters in Health Care Management from Harvard University. Prior to moving to St. Mary Mercy Hospital, he served as faculty at Wayne State University for 12 years training neurosurgery residents in techniques of spinal surgery and functional neurosurgery and was the former Associate Chair of the Wayne State University Department of Neurosurgery between 2015-2017. He was selected among Detroit Hour Top Docs, Best Doctors and Best Surgeons in America for several years. His research is focused on surgical management and outcomes of spinal tumors and reduction of post-operative opioid use. 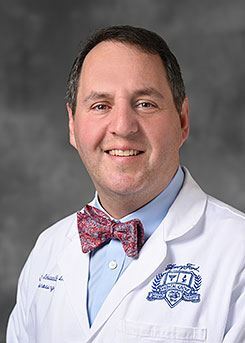 Dr. Schwalb is the Director of Movement Disorder and Behavioral Neurosurgery at Henry Ford Health System and Professor of Neurosurgery at Wayne State University. He obtained his MD from Yale University, where he was named a Farr Scholar, one of five recipients of the medical school’s highest thesis award. He completed his surgical internship at Johns Hopkins University. He completed his neurosurgical residency at the University of Pennsylvania with an infolded fellowship in spine surgery. He then completed a fellowship in Stereotactic and Functional Neurosurgery at the University of Toronto, during which time he also obtained additional training in epilepsy and peripheral nerve surgery. After fellowship, he was Assistant Professor of Neurosurgery at the University of Rochester before being recruited by Henry Ford Health System in January 2009. He has served on multiple committees in national Neurosurgical organizations and is an associate director for the Michigan Spine Surgery Improvement Collaborative. He is a charter member of the Functional Neurosurgical Working Group of the Parkinson’s Study Group and is an ad hoc reviewer for multiple journals. Dr. Pandey is an Associate Professor of Neurosurgery at University of Michigan and currently is the Surgical Director of the Comprehensive Stroke Center. He specializes in vascular neurosurgery using microsurgical and endovascular techniques. He achieved his Bachelors of Science in Biological and Engineering Sciences from the Washington University in St. Louis and obtained his Doctorate of Medicine from Case Western Reserve University School of Medicine. He then gained training in neurological surgery with sub-specialty training in microsurgical and endovascular treatment of cerebrovascular disorders at Thomas Jefferson University Hospital. His research interests include: understanding opportunities to improve clinical outcomes, analyzing large databases to understand how systems of care be designed, development of an ultrasound based technology to treat those with bleeding in the brain, development of a clot buster technology to remove clots from blood vessels of the body and brain, and evaluating the role of deferoxamine in improving outcome in those with ruptured brain aneurysm. His research interests have led to numerous federal grants as well as over 150 peer-reviewed publications. Dr. Jason Heth is a faculty member at the University of Michigan. Dr. Heth specializes in skull base tumors, brain tumors and complex cranial reconstruction. Dr. Heth also does research into the treatment of gliomas and brain metastasis. Dr. Heth lives with his wife in Ann Arbor.